Especially given the recent Charles Carreon nastiness, it is nice to get a reminder that many lawyers are not (and need not be) assholes. Cease-and-desist letters are a frequent source of evidence to the contrary. These are often necessary in order to protect intellectual-property rights, but very often are unnecessarily nasty. Or just unnecessary, or both. See, e.g., "Unicorn-Meat Slogan Draws Cease-and-Desist Letter From Pork Board," Lowering the Bar (June 22, 2010). At the very least, they tend to be lawyerly and unpleasant. Here's some evidence that it doesn't need to be this way. I'm not sure there's a likelihood of confusion there, but it's close enough that it's not surprising it generated a cease-and-desist letter. The surprise was that the attorney didn't feel the need to be a creep. 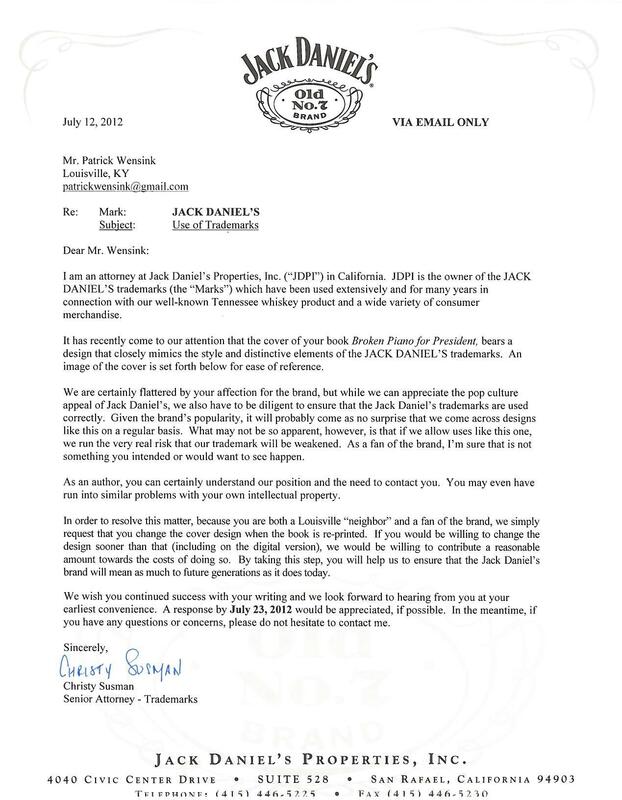 We are certainly flattered by your affection for the brand, [Christy Susman wrote,] but … we also have to be diligent to ensure that the Jack Daniel's trademarks are used correctly. Given the brand's popularity, it will probably come as no surprise that we come across designs like this one on a regular basis. What may not be so apparent, however, is that if we allow uses like this one, we run the very real risk that our trademark will be weakened. As a fan of the brand, I'm sure that's not something you intended or would want to see happen…. [W]e simply request that you change the cover design when the book is re-printed. If you would be willing to change the design sooner than that …, we would be willing to contribute a reasonable amount toward the costs of doing so. By taking this step, you will help us to ensure that the Jack Daniel's brand will mean as much to future generations as it does today. We wish you continued success with your writing and we look forward to hearing from you at your earliest convenience. It's not just the pleasant tone that is unusual here, it's the "demand." 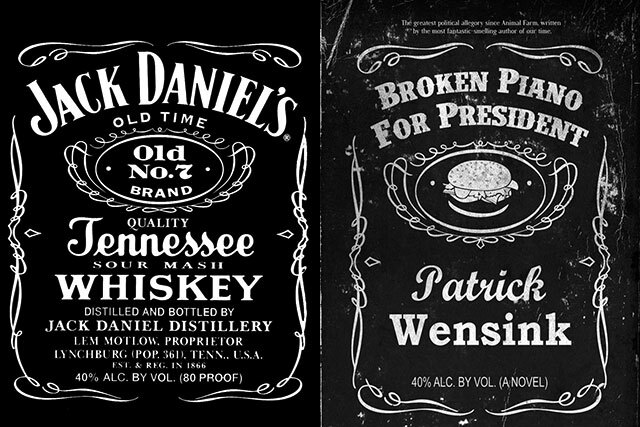 Rather than get all huffy and demand the books be taken off the shelves, Jack Daniel's asked that the cover be changed when (or if) there is a reprint, and actually offered to help pay for that if he was willing to change the design now. I assure you that is not something you see every day. Certainly, the company understood the potential PR value of this kind of response, and it was right about that. It's getting lots of good publicity, and the coverage is also helping the author—I'm not sure how well it was selling before, but as of right now (Thursday) it's at #18 on the Amazon.com 100 list. 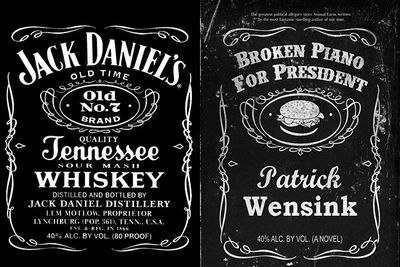 Seems like people really should be buying more Jack Daniel's as a result of this (and maybe they are), but it seems like everybody wins here regardless. Smart call, whiskey maker. For a prior example of a good way to respond to a more traditional cease-and-desist letter, see here.